Prolong your tone with the same premium electric guitar strings that experienced players worldwide trust to keep their incredible tone longer than any other string available. Unlike other string brands, Elixir Strings coats the whole string. This protects not only the outer string surface but also the gaps between the windings where common tone-deadening gunk typically builds up in other brands’ coated and uncoated guitar strings. Crafted to last, these nickel-plated steel electric guitar strings boast a warm, robust tone while the POLYWEB Coating brings a slick, fast feel to the playing experience. 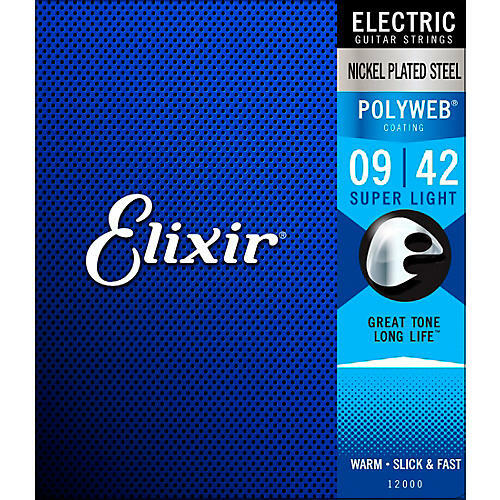 For a more traditionally textured, “uncoated” feel and a brighter, punchier tone, try Elixir electric guitar strings with ultra-thin NANOWEB Coating. Of course, the kind of string you play is all a matter of personal preference. Not sure what tone or feel is right for you? Try them out for yourself, and find your new favorite string from Elixir Strings. Click or call to try a set.